Moscow, Russia. Language: Russian. Publisher: Pervyi v Rossii kruzhok mentalisto; Ripol. Editor: N.B. Butovt. 1/1, December 12, 1906-July-August 1911 (not published 1909-1910). 12 rubles a year (an enormous price). Illustrated. 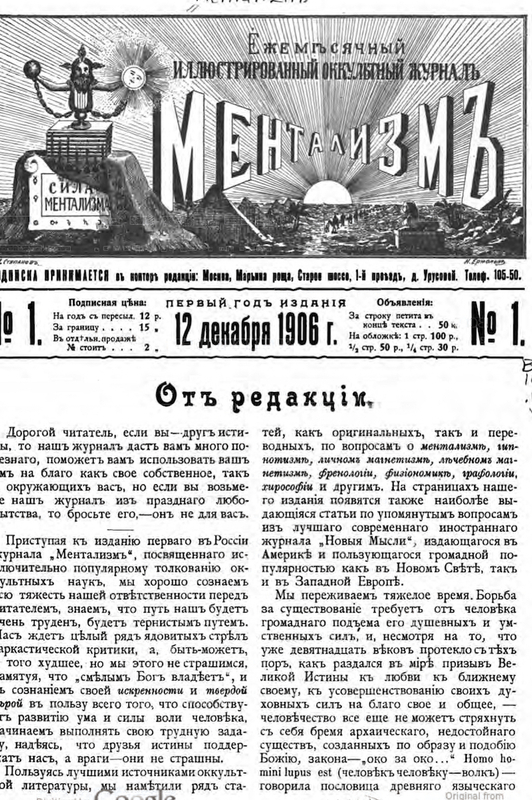 Described in Maria Carlson and R.H. Davis, Jr., "Russian Occult Journals and Newspapers," in Bernice Glatzer Rosenthan, The Occult in Russian and Soviet Culture (Ithaca: Cornell University Press, 1997). NYPL microfilm. Stanford University.